In 1991, at the age of 80, Mr. Lionel Ferbos landed his first steady musical gig, performing every week at the Palm Court Jazz Café in the French Quarter. He’s 95 now and wouldn’t dream of missing a date. That’s why he practices his trumpet for several hours every day – to make sure his audience hears classic, New Orleans jazz that is as close to perfection as he can get it. We think he’s already achieved that goal but he keeps striving to improve. What a wonderful lesson from a man who first started practicing his instrument when he was 15 years old. That was 80 years ago. 1926. 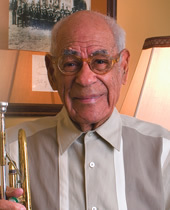 Lionel Ferbos has been a professional musician since 1931, launching his musical career as a trumpeter with ragtime bands like the Starlight Serenaders and Captain Handy’s Louisiana Shakers. Lionel has performed with some of the biggest names in the business and now, 75 years later, his professional career is shining brighter than ever. In addition to his regular live performances as a musician and movie actor (no, we’re not kidding), Mr. Ferbos has become increasingly popular as a recording artist. One of our favorites, “Trombone Shorty Meets Lionel Ferbos,” was recorded when their respective ages were 17 … and 91. Excellence Through Experience … Lionel Ferbos pretty much defines the concept that as we grow in years, so grows our capacity to achieve. Lionel is focused, strong-willed and determined – his direction is always forward, never back. Ragtime might be associated with the past, but like a classic musician, Lionel Ferbos continually strives to give it a new voice, a new passion. Observe one of Lionel’s performances at the Palm Court Jazz Café and you’ll learn a great lesson from the fountain of youth … with all your heart, love what you do. Lionel C. Ferbos … Peoples Health Champion.